The Archives is Salem College’s most fascinating, yet also most underutilized, corner resource, and it is located right under our feet in the basement of Gramley library. 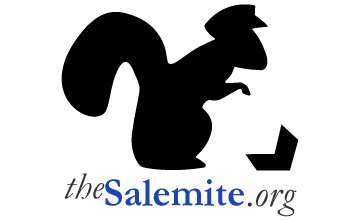 The Archives is a treasure trove of intimate histories and artifacts from Salem’s years of antiquity. It is run by Terry Collins and Donna Rothrock, a small but extraordinarily dedicated staff who work as archivists, librarians and preservationists. The archivists have been working to digitize documents and compile them into collections for convenient online access. This can be found under the Archives section of the Salem College Libraries website. Some of the collections available to view are historic photos of Salem College, academic catalogs starting in 1854 and Sights and Insights from 1904 to 2011. Much of what lies in the Archives is exactly what you might expect—catalogs and records dating back to the nineteenth century which preserve details like accounting and college attendance. As far as papers go, there are also stacks of music programs, sheet music that the students copied by hand and copies of the Salemite that go back decades! Familiar names can be seen on items and antiques preserved in the Archives—the name of Emma Lehman is one of the notable, and it is seen time and time again. Emma Lehman was a botanist and spent fifty-eight years, from 1864 to her death in 1922, teaching for Salem. Lehman left an abundance of pressed plants she labeled and studied in small folded envelopes she collected during her time here. Making sure the delicate plants are secure and that the envelopes are placed into sturdier folders is a current preservation project in the Archives. You might have heard talk of “hair art” kept in the Archives, and this is absolutely not a rumor. Terry unboxed a heavy frame containing an intricate and beautiful design made entirely of, you guessed it, hair. Along with the frame came a list of whose hair is included; according to the list, some of it is from the well-known Bahnson family. While the art is not explicitly dated, Terry estimates that it was made around the 1940s. One Archives object shrouded in mystery is the cricket diorama. The diorama is a creatively handcrafted scene made from the dismembered and reconstructed bodies of crickets and it is titled “Hong Kong Street Vendors.” Nobody knows exactly who the artist or artists are or when it was made, but it does feature a cricket selling tiny shrimps, and is that not enough? If you think that you have nothing worth archiving, think again. The Archives boasts a collection of scrapbooks made by students going back to 1911. The collection includes that of Edith Hanes of the Hanes family, whose 1923 scrapbook includes not just writing but also a number of photographs. Terry mentioned that the Archives would accept scrapbooks and other creations from current students! Another Salem College notable figure whose life can be researched and appreciated throughout the Archives is Hattie Strong, the founder of the Strong Honors Residence Hall and the initiator of efforts to bring the first international students to Salem. Hattie Strong’s exciting and eventful life can be explored in detail thanks to the abundance of materials from her life that she donated to the Archives. Journaling was an active part of Hattie’s life and she always notated her days diligently. One of her journals details her time in the Yukon territory of Alaska where she established a hotel for miners to stay in. Hattie’s impactful life can be traced through the wealth of information that can be found within the Archives. Vintage clothing from students of yesteryear can be found within the Archives as well. A beautiful white lace dress that belonged to alum Birdie Goslen is delicately laid in a box in the Archives. While the style of dress is clearly antiquated, upon viewing the gown it is easy to imagine a student pulling it out and getting dressed for a day at Salem. Terry explained that the dress was used by Goslen as her finals garb. He went on to describe how decades ago, final exams at Salem were oral and held in public for your peers to see. Students were required to wear white dresses. This history of the dress adds to its intrigue, and certainly makes Salem’s current self-scheduled exams sound all the more appealing. There are a plethora of books recounting Salem’s vast history to leaf through that offer insights into notable figures, scholarly changes and the personal lives of students and professors from times long ago. One of these books shares the names of the very first students to attend Salem—Elizabeth Bassey, age 2 ½, Maria Magdalena Meter, 4 ½, and Maria Magdalena Schmidt, 8. Few students realize just how many treasures can be found in the Archives and in an internship or the learning opportunities that Terry and Donna offer. If you would like to explore the Archives yourself, or access some unparalleled primary sources for your research, make an appointment today by emailing archives@salem.edu.